“Pardón de Meana” Step by step procedure now available. “The Pardón de Meana and the Feather of Gallo de León" is a pioneering international work, as it is the first work in English on these subjects. Its objective is to give you everything you need to know about the feather of “Gallo de León", which is possibly the best material in the world for tying of certain patterns of artificial flies. For the first time in fishing literature, we have in front of us the tables which define and identify each of the types of feathers and their qualities and characteristics, along with an in-depth study of all matters relating to the legendary Leon Roosters. In addition, in these pages you have the opportunity to explore the history and the evolution of fly fishing in Spain, which is unique to this country. 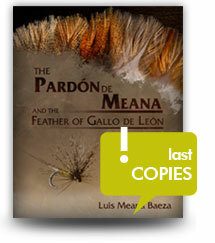 Finally, this book will show, step by step, in extraordinary detail using macro photography, some of the major fly tying patterns based on the rooster feathers of Leon, among them "The Pardon of Meana”, probably the best and most effective imitation of ephemeroptera; whatever the species, in their various stages of emerger, dun and spinner.